(CBS/AP) Giant hogweed is making its way across New York State. What's giant hogweed? Its a towering plant with flower clusters the size of umbrellas, that contains toxic sap that causes blisters and blindness. That's why the state's Department of Environmental Conservation is asking for help locating outbreaks so they can send crews to destroy the toxic weed. New Yorkers should call the Giant Hogweed Hotline at 845-256-3111 to report sightings, and provide photos of potential outbreaks. But the agency warns picture takers not to get too close to the plants. The DEC plans to send six crews totaling 14 people to visit most of the 944 known giant hogweed sites. 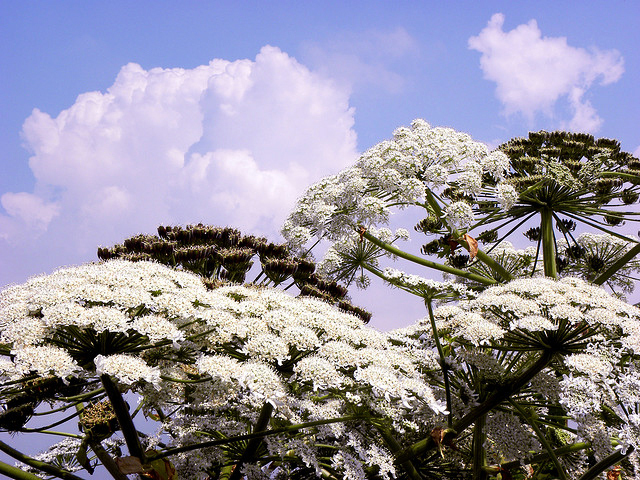 But N.Y. isn't the only state that harbors giant hogweed - there are 10 others. Do hogweed plants grow in your state? What happens when you come in contact with its poisonous sap?